IgA plays a crucial role in establishment and maintenance of mucosal homeostasis between host cells and commensal bacteria. To this end, numerous IgA plasma cells are located in the intestinal lamina propria. Whether the (immediate) precursor cells for these plasma cells can expand locally is not completely known and was studied here. The total number of IgA plasma cells in human ileal biopsies was counted. Sequence analysis of IgA VH genes from human ileal biopsies revealed the occurrence of many clonally related sequences within a biopsy, but not between different biopsies. This observation strongly argues for local expansion of IgA precursor cells. By comparing the number of unique sequences with the number of clonally related sequences within a biopsy, we estimated that ∼100–300 precursors were responsible for the 75,000 IgA-producing cells that were present per biopsy. These precursor cells must therefore have divided locally 9–10 times. Since all sequences contained mutations and most of the mutations present in clonally related sequences were shared, the IgA precursor cells must have arrived initially as mutated cells in the lamina propria. Our data show evidence for the existence of two waves of expansion for IgA-producing cells in human ileum. The first wave occurs during initial stimulation in germinal centers as evidenced by somatic hypermutations. A second wave of expansion of IgA-committed cells occurs locally within the lamina propria as evidenced by the high frequency of clonally related cells. Many IgA plasma cells in the human gut are thought to originate from isotype-switched IgM+ B cell precursors in Peyer’s patches and isolated lymphoid follicles of gut-associated lymphoid tissue (1). During humoral immune responses, Ag-specific cells switch to downstream isotypes and the specificity of the Ab becomes more fine-tuned (i.e., acquire a higher affinity to certain Ags) by somatic hypermutation (SHM)5 of the V region genes. Indeed, high numbers of mutations are observed in human intestinal IgA plasma cells (2). Both class switch recombination (CSR) and SHM take place in the germinal centers of Peyer’s patches and isolated lymphoid follicles (3, 4). Accumulating data suggest, however, that at least some CSR and SHM may also occur outside germinal centers (5). For example, although CD40 knockout mice are unable to generate germinal centers and to elicit T-dependent immune responses, they still have a normal number of IgA-producing cells in the gut (6). It is unclear where this T-independent CSR and expansion of IgA-producing cells takes place. In humans, there is some evidence that CSR can occur within the lamina propria itself as evidenced by activation-induced deaminase expression and the presence of switch circles in the lamina propria of the human colon (7). This isotype switching seems to be T cell independent and is driven by the cytokine APRIL produced by epithelial cells. In line with this notion, Holtmeier et al. (8) showed that the VH gene repertoire of IgA plasma cells in the colon is rather limited. These observations suggest that IgA plasma cell precursors may expand within the lamina propria of the gut. Husband and Gowans (9) demonstrated many years ago that also in the small intestine of rats such a local expansion of IgA- containing cells may exist (9). In this study, we aimed at establishing the contribution of local expansion to the human small intestinal IgA plasma cell pool. To address this issue, we analyzed the VH gene usage, clonal relationships, mutation pattern, and frequencies of IgA-producing cells in human ileal biopsies. Somatically hypermutated IgA sequences from clonally related cells were found in all biopsies. From the distribution of clonally related cells and the number of IgA plasma cells present within one biopsy, we were able to determine the number of precursors that gave rise to all IgA plasma cells within our biopsies. Taken together, our data strongly suggest that after initial expansion within germinal centers, there is a large second wave of local expansion of IgA- committed cells within the lamina propria of the small intestine. After given informed consent (protocol approved by the Medical Ethical Committee of the University Medical Center Groningen) ileal biopsies were taken from patients that were undergoing endoscopy because of different intestinal problems. The intestine of these patients showed no signs of intestinal inflammation upon histological evaluation of the tissues. One patient with diarrhea showed no clinical signs that the diarrhea was of an infectious nature (no fever, no elevated serum C-reactive protein levels). Three ileal biopsies frozen in Tissue-Tek were taken from the ileum of three patients each (P5–7; Table I⇓) and used to show the presence of IgA+ cells by immunohistochemistry. Two biopsies from each patient (P1–P3) were taken from the terminal ileum just before the Bauhin valve (labeled as low) and ∼20 cm above the Bauhin valve (labeled as high). From patient 4 only one biopsy was taken from before the Bauhin valve. Biopsies from patients P1–P4 were snap frozen in liquid nitrogen along with RNase out (Invitrogen) and used for RNA isolation. Biopsies from patients P5, P6, and P7 weighed ∼7 mg, which yielded ∼250 sections of 5-μm thick. IgA+ cells were counted from every 10th section from the biopsy of patient P5, while 5–17 randomly selected sections were counted from the other biopsies. To visualize IgA+ cells in ileal biopsies, cryostat sections were fixed with acetone and incubated with peroxidase-labeled rabbit anti-human IgA. Peroxidase was revealed by diaminobenzidine and hematoxylin staining was used to view nuclei. The surface area of each section (whose IgA-containing cells were counted) was measured using the program Analysis where the area of the intestinal lumen was excluded from the analysis. The number of IgA+ cells was counted from nine biopsies taken from three patients (Table I⇑). RNA was isolated from ileal biopsies by the TRIzol method (Sigma- Aldrich) according to the manufacturer’s instructions. Total RNA (15–20 μg) was dissolved in 100 μl of H2O. Of this solution, 17.5 μl was used to synthesize cDNA using oligo(dT) primers (Invitrogen) in a final volume of 30 μl. Integrity of the cDNA was analyzed by β-actin PCR. VH primers used for samples from P1, P2, and P3 were as described by van Dongen et al. (10). The VH primer set for framework (FR) 1 was used in combination with a 3′ Cα primer. The Taq error rate was determined to be 1 in 3130 nt on the basis of the sequenced parts of the constant region of IgA. The product was loaded onto agarose gels and the ethidium bromide-stained band was ok. To confirm the presence of IgA transcripts from all VH families, PCR was performed on the cDNA of P4 using individual VH 5′ primers with 3′ Cα primers separately. PCR products were gel purified using a gel purification kit (Roche), cloned into pCR4 TOPO vector (Invitrogen), and sequenced using an automated sequencing device as previously described (11). For the analysis of the distribution of Ig H-CDR3 lengths in P1, P2, and P3 patients, PCR were performed by combining the FR3 5′ VH primers (10) with a 3′ FAM-labeled Cα primer. The fluorochrome-labeled PCR products were size separated in a capillary sequencing polymer and detected by automated scanning with a laser in a Megabase sequencer (Amersham Biosciences). Spectrotypes were analyzed with the Genetic Profiler Program (Amersham Biosciences). Nucleotide sequences were compared with the IMGT databases of germline sequences (12) and VH-DH-JH regions were analyzed using IMGT Quest (13) and Joinsolver (14). 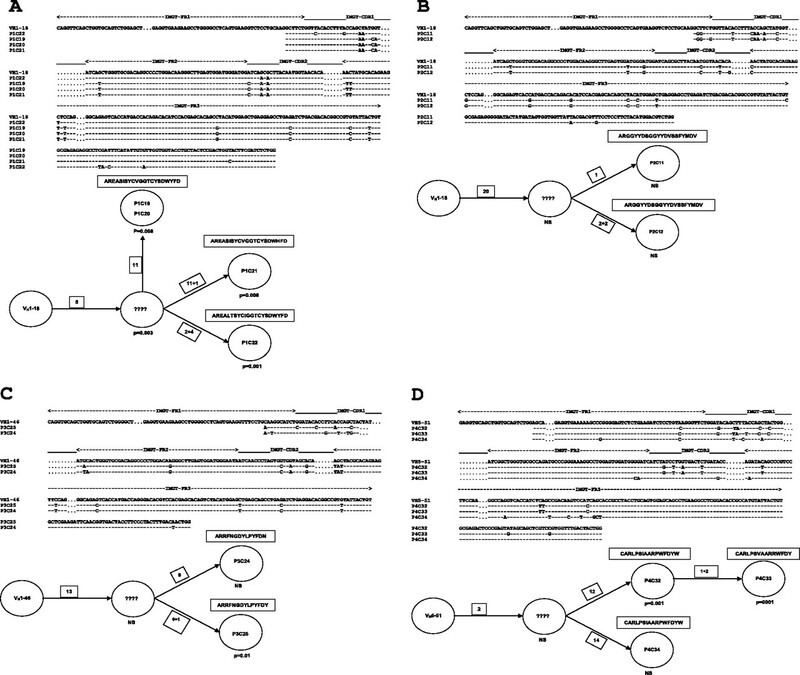 The lengths of the H-CDR3 domains of translated IgA H chain transcripts were calculated as described previously (15). Replacement over silent mutation (R:S) ratios for FR and CDR were determined (16). Sequences having identical VDJ rearrangements were defined as clonally related or derived from the same B cell (see below). Coverage of the complexity of the VH gene repertoire was calculated by considering the number of clonally related sequences compared with the total number of observed, unique VH gene sequences. The probability of picking up unique, new VH sequences in each biopsy is related to the number of B cell precursors giving rise to the IgA repertoire. Coverage C was calculated as C = 1 − f1/n in which f1 = the number of observed unique, individual VH sequences and n is the sample size, i.e., the total number of observed VH sequences (17). A problem in analyzing coverage is that identical VH sequences in one sample could either be derived from the same B cell or from different B cells having identical VH genes. A minimal estimate for the coverage was made by excluding identical VH sequences from the calculation (so consider them as derived from the same B cell), while a maximum estimate was made under the assumption that also identical VH sequences were derived from different B cells. Immunoperoxidase staining was performed on normal ileal biopsies to identify IgA+ cells in the lamina propria. From three patients (P5–P7), three biopsies were analyzed to estimate the total number of IgA+ cells present. Using these numbers, we estimated that there are, on average, ∼75,000 IgA+ cells present per biopsy (Table I⇑). cDNA was synthesized from RNA isolated from six biopsies from other patients (P1–P3) which resulted in appropriate β-actin and IgA signals upon RT-PCR. Because of the high number of IgA plasma blast and plasma cells within our biopsies, we assume that the IgA signals that we obtained from our biopsies were strongly dominated by the mRNA from these plasma blast or plasma cells. The number of precursors that generated the above-mentioned IgA+ cells can be estimated from the diversity of the IgA repertoire in the ileum. To this end, we sequenced IgA VH genes of various biopsies. For each patient, 50 IgA VH sequences from ileum were analyzed. In patients P1, P2, and P3, we obtained 25 sequences from proximal and 25 from distal ileal biopsies, while from patient P4 we analyzed 50 sequences from only one biopsy. Of the 200 sequences 183 sequences were productively rearranged (Fig. 1⇓ and supplemental Tables S1 and S2). Twenty-one sequences were 100% identical to at least one other sequence, resulting in 162 truly unique sequences. We observed many clonally related IgA-VH sequences in all biopsies. These sequences have the same H-CDR3 (i.e., the same VDJ joining), but may have some nucleotide differences within the VH gene (Fig. 1⇓ and supplemental Table S3). B cells with VH genes with few mutations in the H-CDR3 regions can still be considered to be clonally related, especially when there are also shared mutations within the VH region (8). In addition, 100% identical sequences were obtained from six of seven biopsies; only one biopsy did not yield identical sequences. Both clonally related and fully identical sequences were only observed among sequences derived from a certain biopsy, but not in samples taken from one person at distant and proximal ileal sites. In total, we observed 12 sets of clonally related sequences and 11 sets of fully identical sequences (Tables II⇓ and III⇓). Within one set of clonally related cells (the sequences P4C32, P4C33, and P4C34), we cannot formally exclude the possibility that P4C34 belongs to a different B cell clone, because only 2 of 16 mutations of this sequence are shared within the VH region with the sequences P4C32 and P4C33 (Fig. 1⇓D). For our calculations, however, we considered P4C34 as a member of the clone on the basis of its 100% identical H-CDR3 region. Finally, the sequences P3C24-P3C25 might be the result of artificial crossing over during the PCR, since in these sequences the somatic mutations are only present in a limited region of the VH gene. We did include them in our analyses, because we cannot prove such crossing over. Overall, including or excluding such exceptions did not change any of our conclusions. Alignment of sets of clonally related IgA VH sequences. Sets of clonally related IgA VH sequences are aligned and compared with germline VH gene sequences. Sequences of the germline VH gene are shown on top. Dashes indicate identical nucleotides and gaps introduced for uniform comparison of VH genes are marked by dots. Genealogical trees deduced from the mutations observed in the VH genes of these sets are drawn. Hypothetical members of the sets that were not obtained but that can be predicted from building the most logical tree are indicated by questions marks (?). Under each arrow, the number of mutations between different steps are indicated. When additional mutations are present in the H-CDR3, it is indicated separately (for instance as 1 + 1) where the second figure represents the H-CDR3 mutations. Under depicted members, the significance (p) is indicated if the R:S ratio of the H-CDR regions is different than expected from random mutations (NS, p > 0.05). Boxed are the amino acid sequences of the involved H-CDR3. A–D represent four different sets of clonally related sequences. Because of the presence of many clonally related sequences, we were able to estimate how well we covered the complexity of this population of IgA+ cells by comparing the number of unique sequences with the number of clonally related sequences. The coverage within our sample could in principle range from 0%, when every newly obtained sequence is unique, to 100%, when every newly obtained sequence represents a member of a previously described B cell clone. We calculated both a minimal coverage considering all completely identical sequences in a single biopsy as derived from the same cell and a maximal coverage when identical VH sequences were considered to be derived from different cells. The minimal coverage ranged from 8 to 25% while the maximal coverage ranged from 17 to 67% (Tables II⇑ and III⇑). From the coverage it is possible to estimate the number of B cell precursors that were involved to generate all IgA+ cells in one biopsy (Tables II⇑ and III⇑) (18). Based on the minimal coverage, the number of B cell precursors for all 75,000 IgA+ cells in a biopsy ranges from 94 to 373, while the number of B cell precursors based on maximal coverage ranges from 23 to 143. These data show that the number of B cell precursors that gave rise to the IgA+ cells present within one biopsy is very limited. To analyze the random distribution of the ileal IgA+ cells, the H-CDR3 lengths were analyzed by performing spectrotype analysis. With this method, Ig gene PCR products from polyclonal B cell populations from normal tonsils, bone marrow, and peripheral blood give a typical fluorescence peak pattern resembling a Gaussian (normal) distribution curve of the lengths of the products (10). Deviations from Gaussian distributions have been used to detect the presence of clones in suspected lymphoproliferative diseases (10). We amplified IgA VH genes using a single PCR with the described set of FR3-specific primers for all VH gene families (10) in combination with a labeled Cα primer. Spectrotypes of IgA H-CDR3 lengths from ileal samples revealed no clear dominancy of particular B cell clones. Patterns from samples taken at the proximal and distal ileum from the same volunteer showed similar patterns (Fig. 2⇓). The range of H-CDR3 lengths in these ileal biopsies was 39–84 nt, which is in accordance with the variation in lengths of the H-CDR3 regions observed in the sequenced samples (24–81 nt). We also analyzed the spectrotypes of IgA expressed by peripheral blood B cells of healthy volunteers. Similar to the spectrotypes of the ileal samples, there was no clear dominancy of a particular B cell clone in the peripheral blood (data not shown). Spectrotype analysis of IgA VH genes. IgA VH genes were amplified by using a set of FR3-specific primers in combination with a FAM-labeled primer for the constant region of IgA. Labeled PCR fragments were size separated on a Megabase Sequencer and analyzed with the Genetic Profiler Program. The x-axis presents the size of the fragments in bp, while the y-axis presents the fluorescent intensity of the FAM label. Spectrotypes were analyzed from the biopsies that were also used for VH gene analysis. Those biopsies where taken from the terminal ileum just before the Bauhin valve (labeled as L) and ∼20 cm above the Bauhin valve (labeled as H). There was no difference in patterns when amounts of cDNA were serially diluted. The resulting patterns were similar within a range of 200-25 ng of cDNA, with only slightly lower signals in the diluted cDNA samples (data not shown). Although the spectrotype data show that the distribution of B cell precursors is not skewed toward a few dominant B cell clones, sometimes a larger peak with a particular H-CDR3 length can be detected. (see e.g., Fig. 2⇑, spectrotype P1H). Simulations of expected spectrotypes with different distributions showed that our observed spectrotypes fitted well with an equal distribution of a limited number of B cell precursors (data not shown). For analysis of VH gene family usage, we analyzed sequences from samples of patients P1, P2, and P3 that were amplified with a mixture of all different VH gene family-specific primers. More than 40% of the unique IgA sequences utilize VH1 family genes, followed by VH4 and VH3 (Fig. 3⇓). Analysis of the usage of individual VH genes showed that VH1–02, VH1–18 and VH1–69 were among the highest used (>10%), which is in accordance with the observed preference for the VH1 gene family. Individual VH genes that were used between 5 and 10% were VH2–05, VH3–23, VH4–59, and VH5–51. The VH genes VH3–21 and VH4–34 that are often described to be present within mucosal tissues were among the lowest used (supplemental Fig. S2). The presence and nature of somatic mutations in obtained IgA sequences were analyzed by comparison to these sequences with known germline VH sequences. This analysis revealed that all IgA sequences contained mutations; no germline IgA sequences were observed. The mutation frequency varied between 2 and 24% (4–55 mutations). The ratios of R:S mutations for the CDR regions in this study were calculated as described previously (16). Forty percent of the sequences showed a significantly higher R:S ratio in the CDR regions than was expected from random mutations (supplemental Tables S1 and S2). We observed 12 sets of clonally related sequences comprised of 32 sequences in total. The majority of the mutations observed among the clonally related sequences in patients P1, P2, and P3 were shared with 69, 76, and 69%, respectively (Fig. 1⇑). This suggest that after a first round of selection for somatically hypermutated clones having the same mutations, there is a second wave of expansion with only a limited amount of extra mutations. In patient P4, only 24% of the mutations were shared but this frequency is strongly biased by a particular sequence, P4C34, with identical H-CDR3 but with an almost complete different mutation pattern (Fig. 1⇑). In this study, we show the presence of many clonally related IgA-VH gene sequences in biopsies taken from human ileum. Because of the high frequency of these clonally related sequences, we were able to estimate from how many precursor cells the entire population of IgA-producing cells within one biopsy was derived (i.e., the “coverage” of the complexity of the VH gene repertoire in our sample). In essence, this coverage was calculated by comparing the number of unique sequences obtained from a biopsy with the number of clonally related sequences in the same biopsy. A surprisingly low number of <200 precursor cells were found to be responsible for the large number of IgA+ plasma cells in a biopsy. In some biopsies, we obtained some completely identical sequences. These identical sequences could be either derived from the same cell or from different clonally related cells. When we assume that these sequences are derived from the same cell (so-called “minimal coverage”), we estimated that on average only 168 precursors are responsible for all IgA+ plasma cells in one biopsy. However, when the identical sequences are derived from different cells (“maximal coverage”) on average 94 precursor cells are involved. In either case, the consequence of these findings is that there must be significant local expansion in the small intestine of IgA plasma cell precursors. The estimation of the coverage is based on the assumption that there is a more or less equal distribution of the size of all clones of IgA+ B cells, without the presence of one or more dominant clones. This assumption was justified by our spectrotype analysis of the variation of H-CDR3 lengths. This method is frequently used for detection of lymphoid malignancies (10). With this approach, B cell clones can be detected because they disturb the normal distribution pattern of a H-CDR3 spectrotype, when the size of the clone is larger than ∼5% of the total B cell population (19). In our spectrotypes, we found no evidence for the presence of dominant IgA+ B cell clones that could influence our estimated coverage. In addition, we performed simulations with distribution patterns with variable numbers of dominant clones (in addition to nondominant clones). Our observed distribution of IgA-VH gene sequences fitted best with an equal distribution of B cell clones. These data support our notion that within the lamina propria IgA plasma cells are present as locally distributed clones with approximately equal size. The number of IgA+ plasma cells in biopsies taken from human ileum were determined by counting immunohistologically stained sections. Approximately 75,000 IgA plasma cells are present in a biopsy. This number is in line with the observation by Paniangua et al. (20). They estimated the number of IgA plasma cells in the human gut per so-called “mucosal tissue unit.” This unit was defined on the basis of 6-μm-thick tissue sections through a 500-μm wide area (i.e., a volume of 3000 μm3) of the mucosa at full height, from muscularis mucosa to the tip of the villi. Paniangua et al. (20) found that there are ∼86 IgA plasma cells per mucosal tissue unit. The mean number of IgA plasma cells in our nine counted biopsies was 172 cells/mm2 in tissue sections with a thickness of 5 μm (i.e., a volume of 5000 μm3). The volume of our tissue sections is therefore ∼1.67 times (5000/3000) the volume of the mucosal tissue unit used by Paniangua et al. (20). When we converted our IgA plasma cell counts in terms of mucosal tissue units, we observed on average 103 IgA plasma cells per mucosal tissue unit, which is in the same order of magnitude compared with the findings of Paniangua et al. (20). The precursor cells must therefore have divided 9–10 times to give rise to the 75,000 IgA plasma cells present in the biopsies. This expansion must take place locally, because it is extremely unlikely that such large numbers of clonally related cells migrate specifically to a small defined region in the gut after dividing elsewhere in the body. In our samples, we did not observe clonally related sequences between different biopsies from the same individual. In apparent contrast, a number of studies reveal that clonally related IgA+ B cells can be found at multiple distant sites in different parts of the gut (8, 21, 22, 23). The experimental approaches in these studies have in common that only a very restricted population of IgA plasma cells was analyzed: e.g., by amplification of a single selected VH gene (VH4–34) (22), selection of particular H-CDR3 lengths (8), or detection of Ag-specific IgA production after vaccination (23). Among our sequences we did not find clonally related sequences from different sites, but this does not necessarily contradict the above-mentioned findings. This might be due to our sample size and/or to the fact that we did not look to only one particular VH gene (such as VH4–34), but to potentially all VH genes. Dunn-Walters et al. (22) observed that clonally related cells at distant sites share sometimes more mutations with each other then the local members of the same clone. These clones must therefore have been mutated before spreading to distant sites. This notion is in line with our sequence data, showing that within clones, the majority of mutations are shared, implying that mutated plasma cell precursors migrate into the intestinal lamina propria before acquiring additional mutations. The plasma cell precursor cells are likely generated during a first wave of T cell-dependent expansion in germinal centers of gut-associated lymphoid tissues. During this proliferation in germinal centers, the V genes of the B cells undergo SHMs, resulting in (memory) B cells that are selected to bind with higher affinity to the Ag that initiated this response (24). These memory B cells leave the germinal centers and enter via the efferent lymphatics into the circulation. From there they can home back into the intestinal lamina propria, where they finally differentiate to IgA-secreting plasma cells (25). We speculate that after this first wave of expansion in germinal centers, a second wave of expansion occurs after arrival of the isotype-switched precursors of IgA plasma cells in the lamina propria. Whether these precursor cells are already switched to IgA is not clear. More than 80% of the plasma blasts and plasma cells in the peripheral blood express IgA and express the adhesion molecule β7 integrin and the chemokine receptor CCR10, both involved in homing to mucosal sites (26). Alternatively, the mucosal IgA plasma cells could be derived from classical isotype-switched memory B cells or from somatically hypermutated IgM+IgD+CD27+ B cells, which are thought to be involved in T cell-independent humoral immune responses (27). Based on our coverage data, we estimate that the second wave of (local) expansion must involve the aforementioned 9–10 cell divisions. There is evidence that IgA+ (memory) cells are present in the human intestinal lamina propria (28). These cells have still the capacity to divide and may be responsible for the second wave of expansion. We do not know what the driving forces are for this proliferation and the time frame in which this expansion takes place. Furthermore, little is known about the life span and turnover rate of IgA plasma cells in human intestinal tissue due to the fact that, for obvious reasons, BrdU incorporation studies are difficult to perform in humans. The proliferation marker Ki-67 (as well as other markers related to cell division) is for these studies of limited usage because it binds only to actively dividing cells and does not give information on life span and turnover rate. We stained ileal biopsies with Ki-67 and observed that the vast majority (>90%) of IgA plasma cells were unlabeled (data not shown). The virtual absence of staining of the lamina propria suggests that the clonal expansion of IgA plasma cells takes place over a relatively long period of time. The signals that are required for this local expansion in the lamina propria may differ from those needed for their expansion in germinal centers. Possibly, these precursor cells can expand independently from cognate T cell help as suggested by the T cell-independent IgA production observed in T cell knockout mice (29) and by the recent observation of a large number of IgA-producing cells in the lamina propria of CD40−/− mice (6). In this context, it should be noted that some bacterial ligands can mimic CD40L signaling (30), normally provided by activated CD4+ T cells. Importantly, ligation of TLRs by microorganisms can result in T cell independent proliferation and differentiation of B cells (31). TLR-mediated activation of murine B cells also leads to up-regulation of the BAFF family receptor TACI (transmembrane activator calcium modulator and cyclophilin ligand interactor) (32). The cytokines BAFF and APRIL may induce T cell-independent CSR after binding to TACI on B cells (33). BAFF and APRIL are produced by many different cells such as neutrophils, macrophages, and dendritic cells. Recently, He et al. (7) showed that human colonic epithelial cells can secrete APRIL in response to TLR stimulation to drive local IgA isotype switching. Furthermore, these authors observed activation induced deaminase-positive B cells within the lamina propria (7). This enzyme is essential both for SHM and CSR. Our findings indicate that within clones the majority of the mutations in the VH genes are shared between the various members of the clone. The additional mutations acquired during the second expansion phase in the lamina propria do not need per se, however, to be the result of SHM. When only a few (2, 3) mutations are found on top of mutations shared by the clone, this can be due to normal mutation rates. However, in those cases where more than 10 additional mutations are found, we cannot exclude the possibility of ongoing SHM. The lack of some kind of selective microenvironment in the lamina propria (e.g., absence of follicular dendritic cells) could explain why we found no evidence of Ag selection in many of our IgA VH genes. In addition, the accumulation of somatic mutations (in the absence of proper Ag selection) may also result in polyreactive and/or autoreactive Abs despite expressing highly substituted V(D)J genes (34). In conclusion, we provide evidence that a major part of human IgA-producing cells in the ileum are generated in different phases. In the first phase, T cell-dependent activation and multiplication of precursor B cells for IgA plasma cells takes place in germinal centers of the gut-associated lymphoid tissue. These isotype-switched IgA+ (memory) B cells subsequently settle in different regions of the mucosal tissue and undergo a second phase of local expansion. This expansion (of already selected and committed) of plasma cell precursors is likely T cell independent and possibly the result of direct interaction of products from intestinal microorganisms and these B cells. This expansion phase more likely provides the individual with higher numbers of those specificities that are required for homeostasis with the intestinal flora at the mucosa. ↵1 This work was financially supported by a Ubbo Emmius Fellowship (to S.Y. ), by Valorisation Grant 6848 from the Dutch Technology Foundation, and by the Dutch Digestive Foundation. ↵2 Sequences are available at the EMBL (http://www.ebi.ac.uk/) under accession numbers AM279466-AM279644. ↵3 Current address: Department of Food Science & Technology and the Food Processing Center, University of Nebraska-Lincoln, 143 Food Industry Complex, PO Box 830930, Lincoln, NE 68583-0930. ↵5 Abbreviations used in this paper: SHM, somatic hypermutation; H-CDR3, H chain CDR3; CI, confidence interval; FR, framework; R:S, replacement:silent. Boursier, L., J. N. Gordon, S. Thiagamoorthy, J. D. Edgeworth, J. Spencer. 2005. Human intestinal IgA response is generated in the organized gut-associated lymphoid tissue but not in the lamina propria. Gastroenterology 128: 1879-1889. Fischer, M., R. Kuppers. 1998. Human IgA- and IgM-secreting intestinal plasma cells carry heavily mutated VH region genes. Eur. J. Immunol. 28: 2971-2977. Brandtzaeg, P., F. E. Johansen. 2005. Mucosal B cells: phenotypic characteristics, transcriptional regulation, and homing properties. Immunol. Rev. 206: 32-63. Velazquez, P., B. Wei, J. Braun. 2005. Surveillance B lymphocytes and mucosal immunoregulation. Springer Semin. Immunopathol. 26: 453-462. Tsuji, M., K. Suzuki, H. Kitamura, M. Maruya, K. Kinoshita, I. I. Ivanov, K. Itoh, D. R. Littman, S. Fagarasan. 2008. Requirement for lymphoid tissue-inducer cells in isolated follicle formation and T cell-independent immunoglobulin a generation in the gut. Immunity 29: 261-271. Holtmeier, W., A. Hennemann, W. F. Caspary. 2000. IgA and IgM VH repertoires in human colon: evidence for clonally expanded B cells that are widely disseminated. Gastroenterology 119: 1253-1266. Husband, A. J., J. L. Gowans. 1978. The origin and antigen-dependent distribution of IgA-containing cells in the intestine. J. Exp. Med. 148: 1146-1160.
van Dongen, J. J., A. W. Langerak, M. Bruggemann, P. A. Evans, M. Hummel, F. L. Lavender, E. Delabesse, F. Davi, E. Schuuring, R. Garcia-Sanz, et al 2003. Design and standardization of PCR primers and protocols for detection of clonal immunoglobulin and T-cell receptor gene recombinations in suspect lymphoproliferations: report of the BIOMED-2 Concerted Action BMH4-CT98-3936. Leukemia 17: 2257-2317. Guikema, J. E., E. Vellenga, J. M. Veeneman, S. Hovenga, M. H. Bakkus, H. Klip, N. A. Bos. 1999. Multiple myeloma related cells in patients undergoing autologous peripheral blood stem cell transplantation. Br. J. Haematol. 104: 748-754. Giudicelli, V., P. Duroux, C. Ginestoux, G. Folch, J. Jabado-Michaloud, D. Chaume, M. P. Lefranc. 2006. IMGT/LIGM-DB, the IMGT(R) comprehensive database of immunoglobulin and T cell receptor nucleotide sequences. Nucleic Acids Res. 34: D781-D784. Giudicelli, V., D. Chaume, M. P. Lefranc. 2004. IMGT/V-QUEST, an integrated software program for immunoglobulin and T cell receptor V-J and V-D-J rearrangement analysis. Nucleic Acids Res. 32: W435-W440. Souto-Carneiro, M. M., N. S. Longo, D. E. Russ, H. W. Sun, P. E. Lipsky. 2004. Characterization of the human Ig heavy chain antigen binding complementarity determining region 3 using a newly developed software algorithm, JOINSOLVER. J. Immunol. 172: 6790-6802. Rock, E. P., P. R. Sibbald, M. M. Davis, Y. H. Chien. 1994. CDR3 length in antigen-specific immune receptors. J. Exp. Med. 179: 323-328. Dammers, P. M., A. Visser, E. R. Popa, P. Nieuwenhuis, F. G. Kroese. 2000. Most marginal zone B cells in rat express germline encoded Ig VH genes and are ligand selected. J. Immunol. 165: 6156-6169. Good, I. J.. 1953. The population frequencies of species and the estimation of population of parameters. Biometrica 40: 237-264. Chao, Anne, Lee Shen-Ming. 1992. Estimating the number of classes via sample coverage. J. Am. Stat. Assoc. 87: 210-217. Geiger, K. D., U. Klein, A. Brauninger, S. Berger, K. Leder, K. Rajewsky, M. L. Hansmann, R. Kuppers. 2000. CD5-positive B cells in healthy elderly humans are a polyclonal B cell population. Eur. J. Immunol. 30: 2918-2923. Paniagua, R., J. Regadera, J. Alba, M. Nistal. 1985. 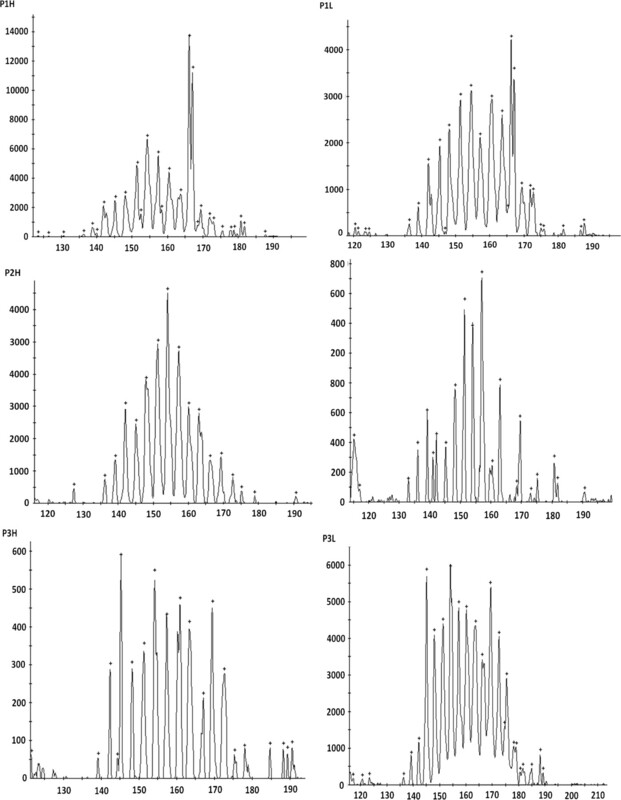 Quantitative distribution of Ig-containing cells in the normal human intestinal mucosa. Anat. Anz. 160: 333-343. Dunn-Walters, D. K., L. Boursier, J. Spencer. 1997. Hypermutation, diversity and dissemination of human intestinal lamina propria plasma cells. Eur. J. Immunol. 27: 2959-2964. Dunn-Walters, D. K., M. Hackett, L. Boursier, P. J. Ciclitira, P. Morgan, S. J. Challacombe, J. Spencer. 2000. Characteristics of human IgA and IgM genes used by plasma cells in the salivary gland resemble those used in duodenum but not those used in the spleen. J. Immunol. 164: 1595-1601. Chang, Q., J. Abadi, P. Alpert, L. Pirofski. 2000. A pneumococcal capsular polysaccharide vaccine induces a repertoire shift with increased VH3 expression in peripheral B cells from human immunodeficiency virus (HIV)-uninfected but not HIV-infected persons. J. Infect. Dis. 181: 1313-1321. Craig, S. W., J. J. Cebra. 1971. Peyer’s patches: an enriched source of precursors for IgA-producing immunocytes in the rabbit. J. Exp. Med. 134: 188-200. Mei, H. E., T. Yoshida, W. Sime, F. Hiepe, K. Thiele, R. A. Manz, A. Radbruch, T. Dorner. 2009. Blood-borne human plasma cells in steady state are derived from mucosal immune responses. Blood 113: 2461-2469. Klein, U., K. Rajewsky, R. Kuppers. 1998. Human immunoglobulin (Ig)M+IgD+ peripheral blood B cells expressing the CD27 cell surface antigen carry somatically mutated variable region genes: CD27 as a general marker for somatically mutated (memory) B cells. J. Exp. Med. 188: 1679-1689. Macpherson, A. J., D. Gatto, E. Sainsbury, G. R. Harriman, H. Hengartner, R. M. Zinkernagel. 2000. A primitive T cell-independent mechanism of intestinal mucosal IgA responses to commensal bacteria. Science 288: 2222-2226. Gaspal, F. M., F. M. McConnell, M. Y. Kim, D. Gray, M. H. Kosco-Vilbois, C. R. Raykundalia, M. Botto, P. J. Lane. 2006. The generation of thymus-independent germinal centers depends on CD40 but not on CD154, the T cell-derived CD40-ligand. Eur. J. Immunol. 36: 1665-1673. Vos, Q., A. Lees, Z. Q. Wu, C. M. Snapper, J. J. Mond. 2000. B-cell activation by T-cell-independent type 2 antigens as an integral part of the humoral immune response to pathogenic microorganisms. Immunol. Rev. 176: 154-170. Mietzner, B., M. Tsuiji, J. Scheid, K. Velinzon, T. Tiller, K. Abraham, J. B. Gonzalez, V. Pascual, D. Stichweh, H. Wardemann, M. C. Nussenzweig. 2008. Autoreactive IgG memory antibodies in patients with systemic lupus erythematosus arise from nonreactive and polyreactive precursors. Proc. Natl. Acad. Sci. USA 105: 9727-9732.